Banks, governments and fintech evangelists all hail a 'cashless future' as both inevitable and good. But this isn't a frictionless utopia; it means that banks mediate our lives to an ever-greater extent. 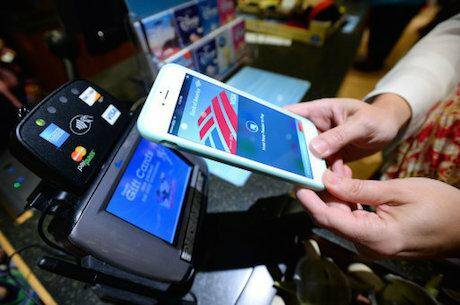 Apple Pay has become a popular cashless payment service. Photo: Jordan Strauss / AP/Press Association Images. All rights reservedSeveral months ago I stayed in an offbeat Amsterdam hotel that brewed its own beer but refused to accept cash for it. Instead, they forced me to use the Visa payment card network to get my UK bank to transfer €4 to their Dutch bank via the elaborate international correspondent banking system. I was there with civil liberties campaigner Ben Hayes. We were irritated by the anti-cash policy, something the hotel staff took for annoyance at the international payments charges we'd face. That wasn't it though. Our concern was an intuitive one about a potential future world in which we'd have to report our every economic move to a bank, and the effect this could have on marginalised people. Our concerns are unfashionable. Without any explicit declaration, the 'war on cash' has begun. Proponents of digital payment systems are riding upon technology-friendly times to proclaim the imminent Death of Cash. Sweden leads in the drive to reach this state, but the UK is edging that way too. London buses stopped accepting cash in 2014, but do accept MasterCard and Visa contactless payment cards. Every cash transaction you make is one that a payments intermediary like Visa takes no fee from, so it has an interest in making cash appear redundant, deviant and criminal. That's why, in 2016, Visa Europe launched its "Cashfree and Proud" campaign, to inform cardholders that "they can make a Visa contactless payment with confidence and feel liberated from the need to carry cash." The company's press release declared the campaign "the latest step of Visa UK’s long term strategy to make cash 'peculiar' by 2020." There you have it: an orchestrated strategy to make us feel weird about cash. Propaganda is a key weapon of war, and all sides present themselves as liberators. Visa comes across like a paternalistic commander when assuring us that we – like a baby taking first steps – will feel a sense of achievement at liberating ourselves from the burden of cash dependence. Visa's technology offers freedom without dependence or dangers. Criminals use many things that we keep – like cars – and fighting crime doesn't take priority over maintaining other social goods like civil liberties. The emergent consensus among economic and political elites is that this is the direction to go in, but to manufacture consent for this requires a drip-drip erosion of public resistance. Hearts and minds must be shown that the change represents inevitable and desirable progress. Anyone defending cash in this context will be labelled as an anti-progress, reactionary, and nostalgic Luddite. That's why we must not defend cash. Rather, we should focus on pointing out that the Death of Cash means the Rise of Something Else. We are fighting a broader battle to maintain alternatives to the growing digital panopticon that is emerging all around us. To understand this conflict, we must step back. A monetary transaction involves specific goods or services being exchanged for tokens giving access to general goods and services from others. The pub landlord hands me beer at night if I transfer tokens that allow him to get cigarettes from a shopkeeper in the morning. There are two ways to implement this though. The first is to give the tokens a physical form. In this scenario, 'getting rich' means accumulating those physical things and 'making a payment' means handing them over to someone else. They are bearer instruments, which means nobody keeps a record of who owns them. Rather, whoever holds them owns them. This is your wallet with notes in it. This is cash. Alternatively, you can use a ledger. Someone sets up a database with spaces allotted to different people. This is then used to keep a record of who has tokens. These tokens have no physical form, but are written into existence. They are 'data objects', and they are 'moved around' by editing the record. The keeper of the ledger thus maintains an account of what money is attributable to you, 'keeping score' of it for you. In this system, 'getting rich' means accumulating a high score on your account. 'Making a payment' involves identifying yourself to the keeper of the ledger via a communications system, and requesting that they edit your account, and the account of whoever you are paying. Does this sounds familiar? It is your bank account. Over 90 per cent of the UK's money supply exists nowhere but on bank databases. Old banks used actual books to maintain these account ledgers, but modern banks use digital databases housed in huge datacentres. You then interact with them via your internet banking portal, your phone app, or by going into a branch. This is not a minor part of the monetary system. Over 90 per cent of the UK's money supply exists nowhere but on bank databases. It is upon this underlying infrastructure that payment card companies like Visa build their operations. They deal with situations in which someone with one bank account finds themselves in a shop owned by someone else with another bank account. Rather than the pub landlord giving me his bank details for a manual transfer, my card sends messages through Visa's network to automatically arrange the editing of our respective accounts. Many fintech – financial technology – startups specialise in finding ways to augment, gamify or streamline elements of this underlying infrastructure. Thus, I might use a mobile phone fingerprint reader to authorise changes to the bank databases. Much fintech 'disruption' merely involves putting slicker clothes on the same old emperor. And so we get Visa's Cashfree and Proud campaign. If people really were ashamed of cash, they wouldn't need ads to tell them. Visa must engineer that shame to teach you that what you want is the same as what they want. And if you don't want it, just remember that cashless society is inevitable. Don't get left behind. But this system will leave many behind. It is hardwired to include only those with access to a bank account; and bank accounts are hosted by profit-seeking corporations that operate at scale. They have no time for your individual idiosyncrasies. They cannot make profit off anyone who cannot easily be categorised and modelled on a spreadsheet. o, good luck to you if you find yourself with only sporadic appearances in the official books of state, if you are a rural migrant without a recorded birthdate, identifiable parents, or an ID number. Sorry if you lack markers of stability, if you are a rogue traveller without permanent address, phone number or email. Apologies if you have no symbols of status, if you're an informal economy hustler with no assets and low, inconsistent income. Condolences if you have no official stamps of approval from gatekeeper bodies, like university certificates or records of employment at a formal company. Goodbye if you have a poor record of engagements with recognised institutions, like a criminal record or a record of missed payments. Back in Amsterdam I hang out with Ancilla van de Leest of the Netherlands Pirate Party. She only visits establishments that accept cash, true to her political belief in individual privacy from prying eyes. It would be wrong to assume, however, that Ancilla's primary concern involves surveillance by a Big Brother-style bogeyman. It's true that your spending patterns reveal much about how you actually live, and the privacy implications of having these recorded in searchable database format are only starting to be uncovered. We know that targeted individual surveillance of payments occurs by the likes of the FBI and NSA, but routinised mass surveillance could become a norm. Imagine automatic flagging systems triggered by anyone engaging in a combination of transactions deemed subversive. Tax authorities are bound to be building systems to flag discrepancies between your spending patterns and your declared profits. Such automated dystopias should ideally be avoided, so a dose of paranoia about digital payments systems is a healthy impulse, even if it might be unwarranted. But that isn't really the point. What's more important to Ancilla and me is the looming sense of an external watcher that 'assists', 'guides' or 'helps' you in your life, tracking and logging your moves in order to influence you. The watcher is not a single entity. It's a collective array being incrementally built in stages by startups and companies around the world as we speak. We feel it seeping deeper into our lives, a mesh of connected devices, cookies and sensors. Whether we visualise it as the benevolent eyes of a parent, or the menacing eyes of a tyrant doesn't matter. The point is that the eyes have the potential to monitor you, all the time. The proclaimed Death of Cash is thus an episode in the broader drama that is the Death of Privacy, the death of breathing room, and the death of informal, non-measured, unaccounted-for behaviour. Every action you take must forever be attached to your digital persona, dragging with it a data trail extending back to the day you were born. We face creating an entire generation of people who do not know what it feels like to not be monitored. For many economists, the war on cash will be resolved by their favourite mystical demigod, the market. This guiding force prevails when utility-maximising producers and consumers go around making rational choices with perfect information about their options, and with total freedom to choose whether or not to exercise those options. If digital payment transaction costs are lower, then cash will rightly die. The pristine realm of market theory is unfit to assess the dynamics of this situation. This article was first published on 'The Long and Short', republished here under Creative Commons License 4.0.